This would not detect my gridseeds. Do I need to change/repeat that to correlate to my gridseed STM32 virtual COM ports? I couln’t see a number assigned to them. 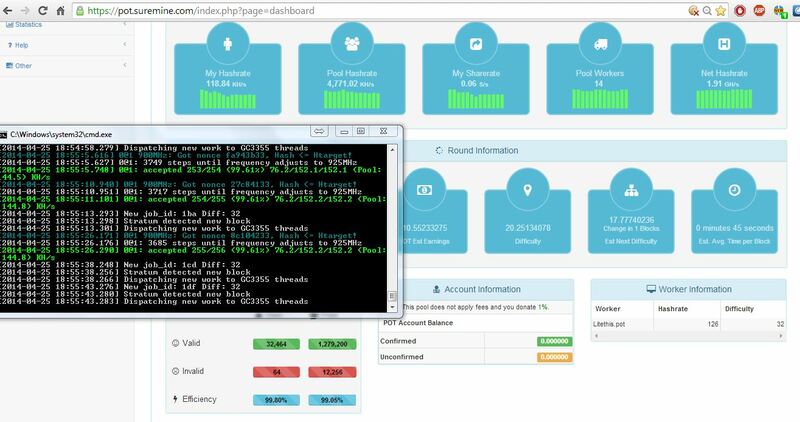 ..but still it cannot find the gridseeds, whereas cgminer has no problem. For the line “–gc3355=DEV0,DEV1” I tried replacing DEV0 and DEV1 with various COMx numbers, STM32, and the individual serials of each gridseed, to no avail. Reinstall the STM drivers Rowan. You have to use the STM drivers. & thanks admin for putting this together. I’m pretty sure the STM drivers are installed OK already because cgminer has no problem, its just cpuminer that can’t see the gridseeds. I reinstalled the STM devices but still no luck. Even when I uninstall the STM32 com ports from device manager, ticking “delete driver software” too), AND uninstalled the STM drivers from Add/Remove Programs, they still get re-recognised as STM32 virtual COM ports, with no COM number, when I replug the USB. Rowan – you might have disabled the device in Device Manager. Make sure it is enabled. Also, in Device Manager right click on the device and (from memory) it’s properties and then advanced to change the com port number. After you reinstall the STM driver you need to unplug and plug your gridseeds back in. You can see if they are working properly in windows by going to the start button and in the search search for device manager. Run that and look under ports drop down. If your gridseeds are plugged into a usb port on your computer somehow, (including hubs) then they will each have a com port. Looks great. I have 4 gridseeds. Will I be able to use this with all 4 or will I need to run an instance of CPUMiner for each gridseed? Thanks for suggestions but still not working. By the way, anyone experienced that the CPUMiner stop sending shares in a random manner that you’re forced to re-start the instance? It’s really annoying me and I can’t find any solution. However seems I don’t have such problem using cgminer. Any suggestions? Just wondering if this is safe to run on a fanless gridseed. I used the autotune feature and was pushing one of the chips to a frequency of 975. Will the gridseed get too hot? Thanks! It’s safe because the voltage is what causes heat, not frequency. Stanley thats the driver I have already been using. Its getting rid of it that seems to be my problem.. after uninstalling it is still there so I can’t see my com port numbers before I reinstall it. I’ve been running my miners with this new version of cpuminer and so far am getting much better results than BFGMiner (CGMiner keeps crashing on me at random times). Great work sandor111!! We have updated the package with a binary compiled from the latest source, it has some tweaks and fixes, just redownload the package above to get the latest version compiled for Windows. Thanks for the driver link, just what I needed. anyone know if this fork will work on raspberry pi? I just got mine, intending on using is strictly for my gridseeds, but this new fork of CPUminer is running so well on my old windows machine I almost hate to stop it. Thas Yuna. Anyone know how to get this running on a Raspberry Pi? I just got mine and have little linux experience. I tested the autotune out overnight on a fanless gridseed unit. It was so warm in the morning you could barely touch it so becareful running the autotune on a fanless unit. Thanks Admin for your reply. Unfortunately I don’t have a pi I have mine connected to my pc. MinerXD, sorry that was a reply for JS, not you. Did you see what was the frequency of the chips of the device in the morning and if it was still running fine? The unit seemed to be running fine I was just concerned it was going to damage the chips. My gridseed is not voltmodded. Appreciate the response admin. I assumed that the RPi with gridseed support already had their own built-in miner that couldn’t be modified (other than pools). I’ll give Scrypta and Hashra Controlla a go tomorrow. Regardless of what I do I’ll be using this new CPUminer as I’m getting much better hash rates than any other miner I’ve tried. Antivirus was blocking the minerd.exe. Thanks for this! My hash rates on the mining pool look better than before while using CGMiner. Support for individual chip frequency is added. It’s possible to run regular USB miners and G-Blades on one instance, the number of chips is auto detected. Which file is for the Individual Chip Frequency on the github site? The windows binary has been updated to the latest source, just redownload it and check the Readme for the new features. I’m having the same issue with this version of CPUMiner – did you find a fix? Still having issues with the hash report difference. There was a brief moment (about 20 seconds) while mining with CPUMiner Forked of 320kh/s reprted on a pool. After that, those numbers never showed again. Ran a speed test and the upload speed is at 5.50Mbps from the internet provider. Ethernet connection here is ironically worse than WiFi. Ethernet mining would never get past 130kh/s. With that, I believe the issues are somewhere else. As many requested, a TUI has been added. You can download the Windows/Rpi binary from my git if you don’t want to wait. Anyone get this going on Scripta or Hashra Controla yet? I”m running 20 gridseeds and everything is working fine except I can’t get gsd 10 and gsd 15 to start. They register 0 – any ideas? MotoBean, restarting the miner software and plugging their power and usb connectors off and on does not help? took a new look this morning and realized it was an error in the script – thanks. Ideas? Are we higher than 9d now? Hey, can someone give me a working template for WeMineLTC? I’m having trouble with Hashfaster, or at least I think it’s an issue on their end. I can’t seem to configure it for WeMineLTC, as it keeps saying something like “stratum connection failed” or something like that. Email me at KiaX100002@yahoo.com, and it would be great if you have your user and whatever in there, as it would help me configure it correctly. Hey, I could only mine for you, right? ./minerd –gc3355-detect -o stratum+tcp://eu.wafflepool.com:3333 -u 1AmZ3 ….. I have a blade and a mini. 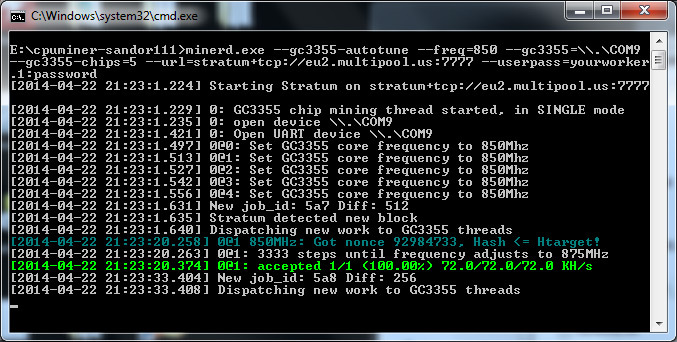 and the work fine with cgminer . Add on to my previous post . If you used cgminer, just before to start cpuminer, you must restart the computer to free the usb device . Even if you stopped cgminer , it’s not enough . Sandor, i really appreciate all the hard work you have done updating this. its so much better than having to run an instance per gridseed. i wonder, does this new version support Dual mining mode? i didnt see the –dual flag in the readme or the help. guardLK, this is miner for Scrypt only mode, does not support Dual mining mode. can you give me an example batch file if I wanted to set my gridseed to mine at 850mhz on chip 0, 875 mhz on chip 1 and 2, and 900 mhz on chip 3 and 4.. ? autotune gets it there eventually but it’d be nice to just start it that way..
You can either use the serial number of the device or the port it is attached (the ports are different depending on the OS – Linux or Windows), the example above is with the serial, then setting the frequency in MHz and then giving the number of each chip. This is for a 5-chip ASIC, for 80-chip G-Blade the line will be much longer going from 0 to 79, instead of from 0 to 4.
so instead of –gc3355-freq=5A72558F3125:850:0 to start chip 0 at 850.. I could type –gc3355-freq=\\.\COM3:850:0,\\.\COM3:825:1 … ? Has anybody seen problems with getting results from a gc3355? This software properly detects my gridseed and sends it a block to work on, but seems to run into problems resetting after the block is complete. It’s a voltmodded unit, but I’ve tried with clocks from 600-1200. It was tested at 1200 by the person who did the mod, but hasn’t worked since I received it. Is it possibly from shipping damage? Google can’t find anybody complaining about this particular error message. Here’s the output from a run on Ubuntu 14.04. It also fails on Win 8.1 on another computer so that eliminates a few variables. I modified the source it prints out how many bytes write returned, -1 in this case. I’d appreciate any advice on how to debug this.